This podcast is a story. About living and working in shelters. And how we ended up in them. This is the final episode of six. We suggest you start with episode 1, then listen to episode 2, 3, etc. This podcast series was made by a group of young queer, trans, racialized, and straight folks who have lived in the Toronto shelter system. Or didn’t, because staying away seemed safer. We also invited in some supportive not-so-young-folks who provided technical support, raised funds, did some acting, and helped make this project happen. The stories in the episodes come out of our experiences in the shelter system. They also come out of our hopes. Our hopes for safe, anti-racist, queer & trans positive, accessible, and affirming services for all marginalized people who are homeless, street-involved, or need to get away. There is far more that we want, and don’t want, and many of us are actively working towards these goals. You’ll get a sense of what we think could work, and what we know doesn’t, by listening to the episodes. While the stories are based on our lives and experiences, none of the stories are any one person’s. Characters are composites of ourselves, our friends, our colleagues, our families, those we’ve lived with (some of whom were decidedly not our friends), and those we would like to see working with us. Many of the scenes involve violence. We talked a lot about what to include and what to leave out. We decided that since violence is such a part of what brought many of us to shelters, and our experiences living in shelters, we couldn’t avoid dealing with it. While we have worked hard not to have any graphic violence, we do recognize that several of the scenes may be difficult for some people to listen to. This episode has discussions of a drug overdose and suicide attempt. This is the fifth episode of six. We suggest you start with episode 1, then listen to episode 2, 3, etc. The podcast series was made by a group of young queer, trans, racialized, and straight folks who have lived in the Toronto shelter system. Or didn’t, because staying away seemed safer. We also invited in some supportive not-so-young-folks who provided technical support, raised funds, did some acting, and helped make this project happen. This episode has scenes of physical violence and discussion of suicide. This is the fourth episode of six. We suggest you start with episode 1, then listen to episode 2, 3, and then this one (episode 4). The stories in the episodes come out of our experiences in the shelter system. They also come out of our hopes. Our hopes for safe, anti-racist, queer & trans positive, accessible, and affirming services for all marginalized people who are homeless, street involved, or need to get away. There is far more that we want, and don’t want, and many of us are actively working towards these goals. You’ll get a sense of what we think could work, and what we know doesn’t, by listening to the episodes. This episode has scenes of racism. This is the third episode of six. We suggest you start with episode 1, then listen to episode 2, and then this one (episode 3). This episode has a scene of sexual assault. This is the second episode of six. Many of the scenes involve violence. We talked a lot about what to include and what to leave out. We decided that since violence is such a part of what brought many of us to shelters, and our experiences living in shelters, we couldn’t avoid dealing with it. While we have worked hard not to have any graphic violence, we do recognize that several of the scenes will be difficult to listen to. We hope you enjoy episode 2. This is the first episode of six. This episode does not have overt violence. It does contain explicit language. We hope you enjoy episode 1. 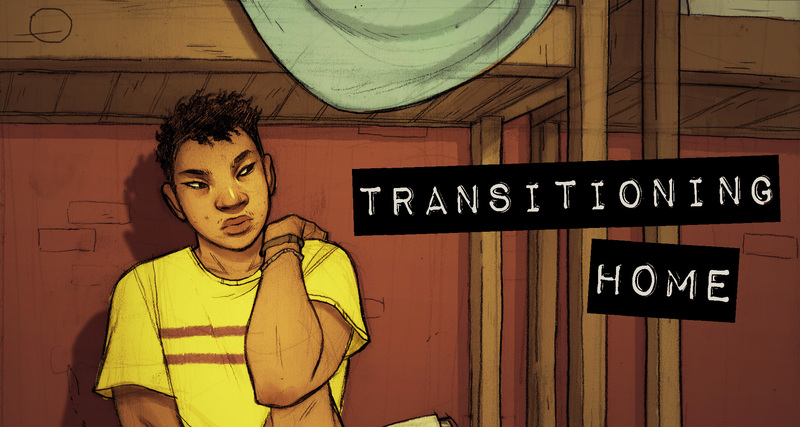 Welcome to Transitioning Home, a podcast about living trans, queer and racialized in the shelter system. Transitioning Home is a six-episode podcast. The first two episodes will be released early May. After which, episodes will be released weekly, until all are posted. To learn more about Transitioning Home see the About page and the Cast Bios. A podcast about living in the youth shelter system.